Here I will explain how to reset identity column value in SQL server or change or rest identity column value to 1 in SQL server. 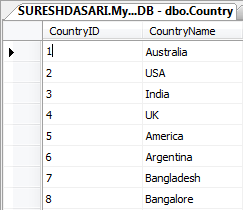 or reseed identity column value in SQL server. Ex: Above table contains 8 records after delete all the records if I insert new record CountryID value will start from 9. Can we truncate the table? As far as I know, if we truncate the table the identity coloum is set to 1. All the objects which are depend on the table will also gone.